So we braved the traffic this morning for a short trip to Guitar Center to pick up the Smart Man's Christmas present. 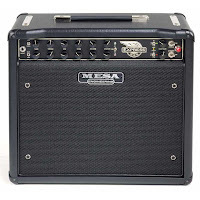 This year he wanted a Mesa Boogie Express 5:25 amplifier, which he selected and I paid for. The Smart Man does enjoy his toys, and this is evidently the guitarist's first choice when it comes to flexible, small amplifiers. I wouldn't know - my job is to swipe the plastic, baby. I was trying for the life of me to figure out how the DOG fit into this. MG, don't you know by now that Boogie fits with EVERYTHING? He's like that little black purse - the perfect (loveable) accessory. Hehehe, just a little hard to sit on the table at your plate!